One of my favorite things about Cheesecake Factory, besides the cheesecake of course, are the Sweet Corn Cakes. 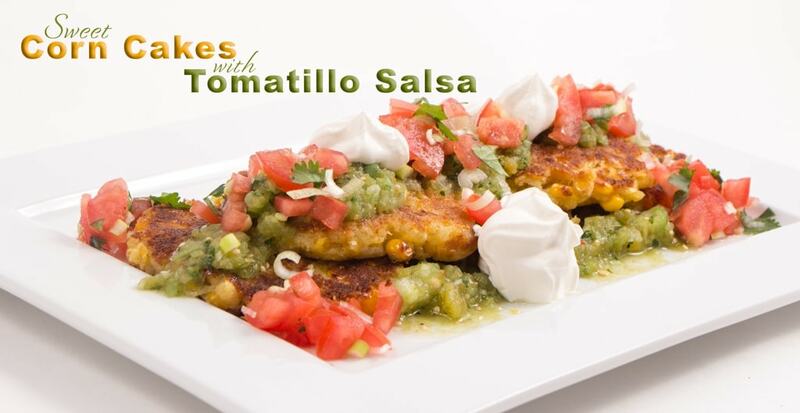 They are cooked up so wonderfully and served with Tomatillo Salsa. It’s absolutely delicious. Here is my take on the Sweet Corn Cake Recipe from Cheesecake Factory. Be sure to check out my recipe for Tomatillo Salsa Too! This recipe calls for Frozen Sweet Corn, there is just something about Frozen Sweet Corn that differs from canned sweet corn, so do yourself a favor and buy frozen. It really is best, especially for this recipe. 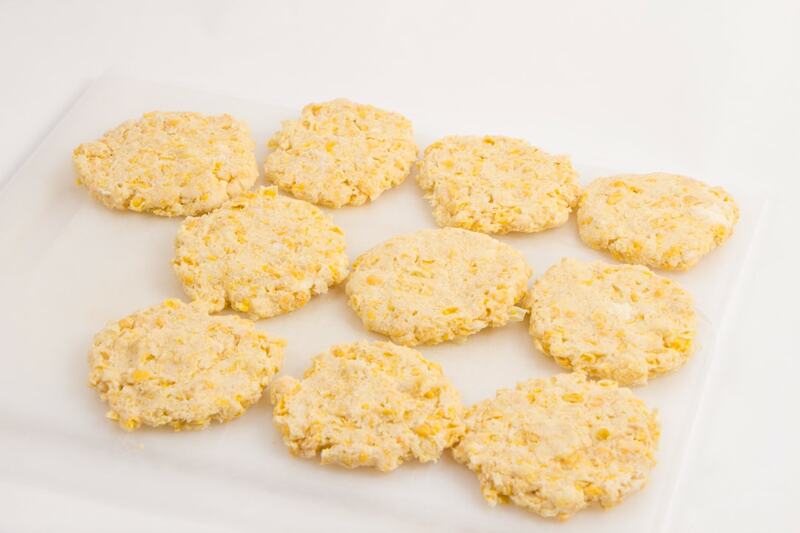 Sweet Corn cakes have very few ingredients, Corn, Masa Flour which is essentially corn flour, sugar, salt and butter. That’s it. It’s an easy blend together kind of recipe too. But in the end you will have a mouthful of flavor that will bring you back for more. You will need to take about 3/4th cup of thawed corn and put into a food processor and grind it up. You want a good puree, so just let it chop and blend. Then in a large mixing bowl place your thawed whole kernel corn, the pureed corn, masa flour, sugar, salt and room temperature butter. You do NOT want melted butter. I use a hand mixer to mix all these ingredients up so the butter gets mixed throughout. Then I use my medium cookie scoop, 1 1/2 in, to have uniform cakes. I use my hands to pat them out and then place them on waxed paper. You don’t want them too thin, but keep them consistent. They will cook better if you do. I can get about 10 corn cakes from this recipe. But if you want larger cakes you will get less. Over medium heat allow your fry pan to get hot and use about 1 tablespoon of olive oil. 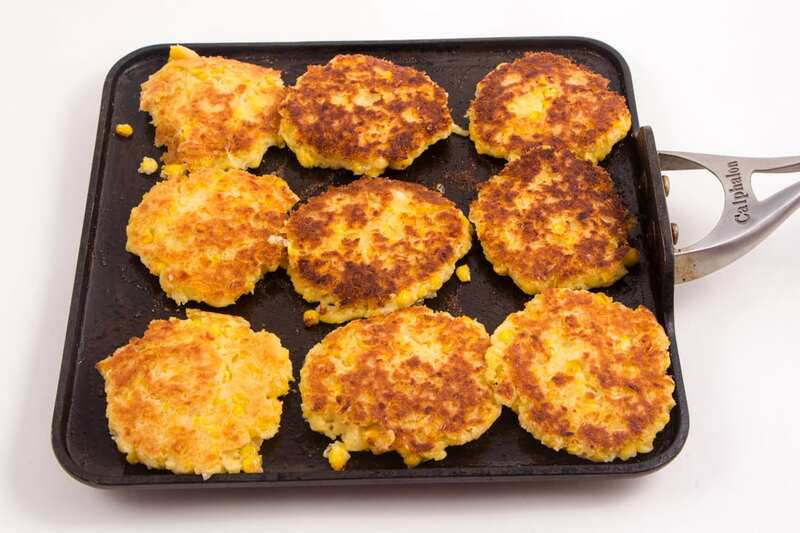 Once the skillet and oil are hot place your corn cakes on the pan. Hear the sizzle? Oh that is what you want! No be patient because these little bad boys are super fragile so don’t try to flip them too soon or they tent to fall apart. I let mine cook 4-5 minutes per side. It really depends on your heat. I like to cook them longer so the middle gets cooked and has a nice texture and not a raw mush. Once they are finished you can plate them up and enjoy. They are truly delicious if served with Tomatillo salsa and sour cream. 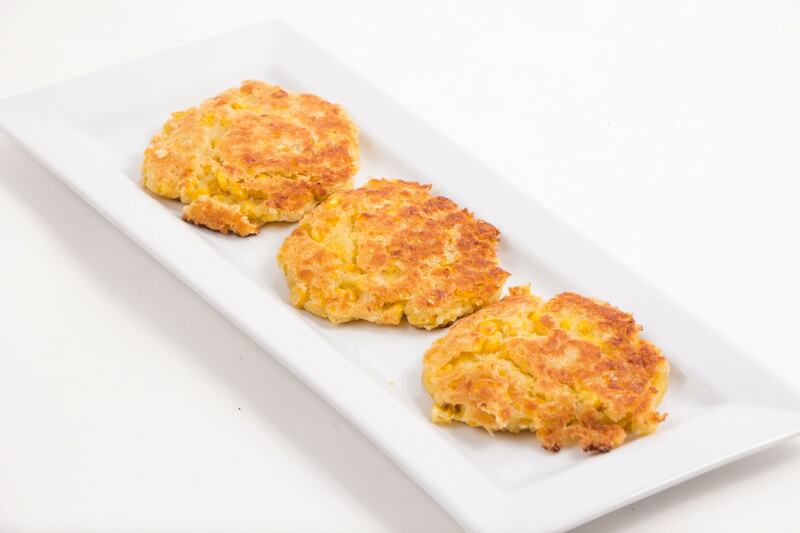 Sweet Corn Cakes a Copy Cat Recipe from The Cheesecake Factory are a favorite. 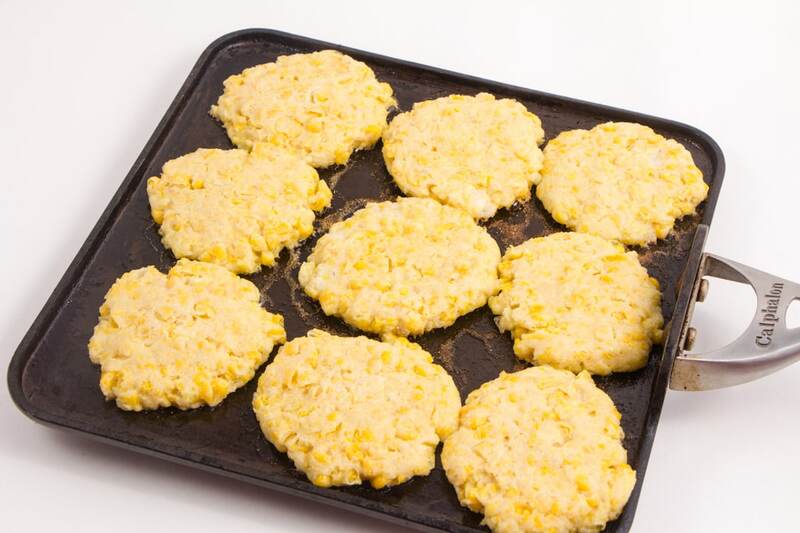 These sweet corn cakes cook up easily and have that wonderful cast iron taste you would expect from Mexican food. 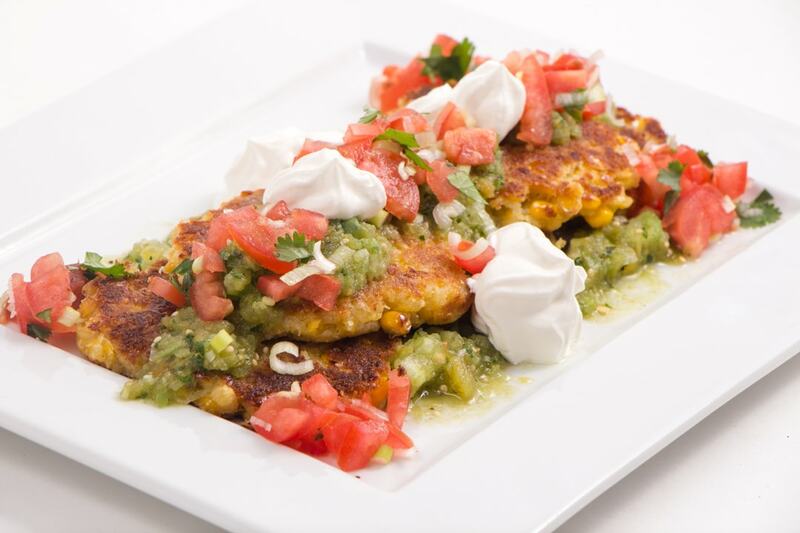 Pair the Sweet Corn Cakes with Tomatillo Salsa and you have a party in your mouth. Full of sweet flavor to add zest to any meal. 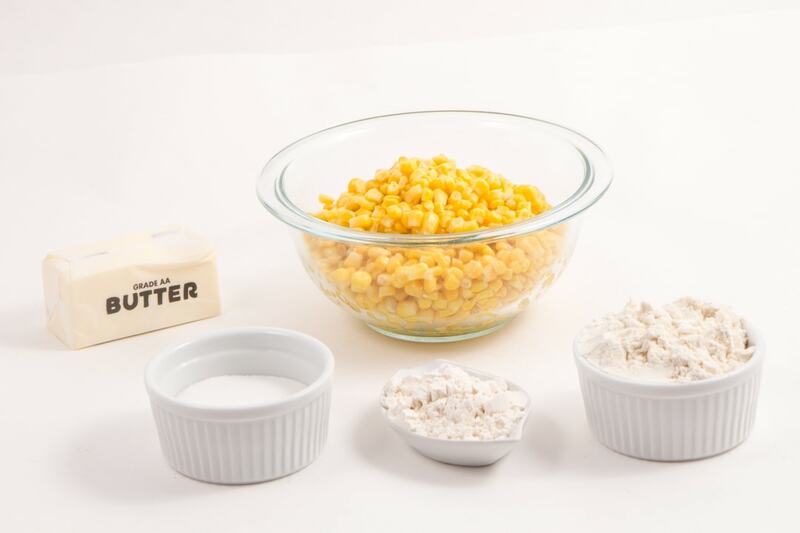 In a mixing bowl combine whole kernal corn, puree corn, masa flour, sugar, flour, salt and butter. Mix with a hand mixer to combine. Over medium heat (6-7) heat fry pan with Olive Oil. When pan and oil are hot place corn cakes on hot pan. Allow to cook for 4-5 minutes per side. You want a nice golden color before you flip the cakes. Cook an additional 4-5 minutes on the other side. Serve with Tomatillo Salsa, Sour Cream, Tomatoes. I gave these a try and they were delish! Thanks for the idea! I love them and can’t believe how easy they really are. So glad you loved them too! Wow! I’ve never had these at the Cheesecake Factory! They look wonderful, and how great to be able to have them anytime! Ohhhh. These look delicious and simple to make! I might have to try them soon! These look great! I totally agree with you on frozen sweet corn vs canned. Thees are a wonderful snack, appetizer, or side dish. We love them! I’ve not heard of these before but they look delicious! Definitely going to give this recipe a try. I hope mine turn out just as good! Lucy.. Yours will. It’s such a great recipe. Let me know what you think of them! These look superb! Can’t wait to try! They are superb. The Tomatillo Salsa also adds a nice touch too! 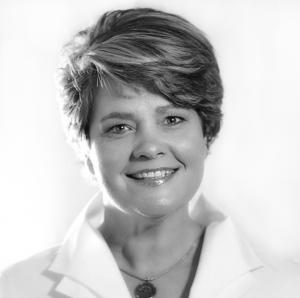 Wow – this sounds SOOO good!! I can’t wait to try it – one of my faves from Cheesecake Factory. I love Cheesecake Factory, I can’t wait to try these! This looks delicious. I love the cheesecake factory but most of all I LOVE corn. I’ll definitely be giving this recipe a try. Thank you for sharing. These would be devoured in my house! I’m saving this to make with some sweet summer corn and a heirloom tomatoes! Delicious! Oh yum! These look so good. I’ve never tried the real deal but I do want to try this one! 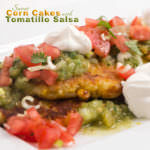 I never thought I could get on board with anything called a “corn cake” but these look DELICIOUS! I already started my next grocery list just so I could put these ingredients on it. Looking forward to trying them out! Ooooooohhh, yummy! Those are some of my absolute favorites! I could eat this every day! And the Tomatillo Salsa with it is amazing too! 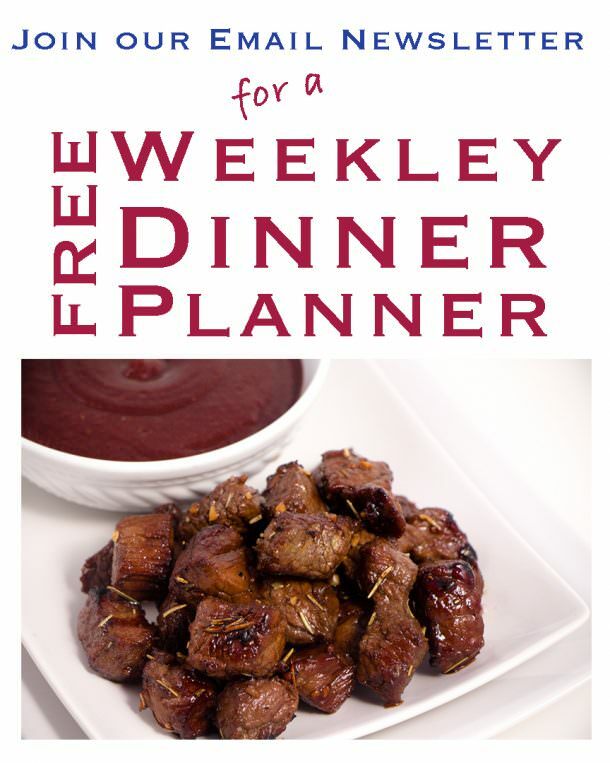 What a fun recipe to make right at home!